The mobile food trucks are still a novelty out here in Coco County, so I’m out stalking them during lunchtime. 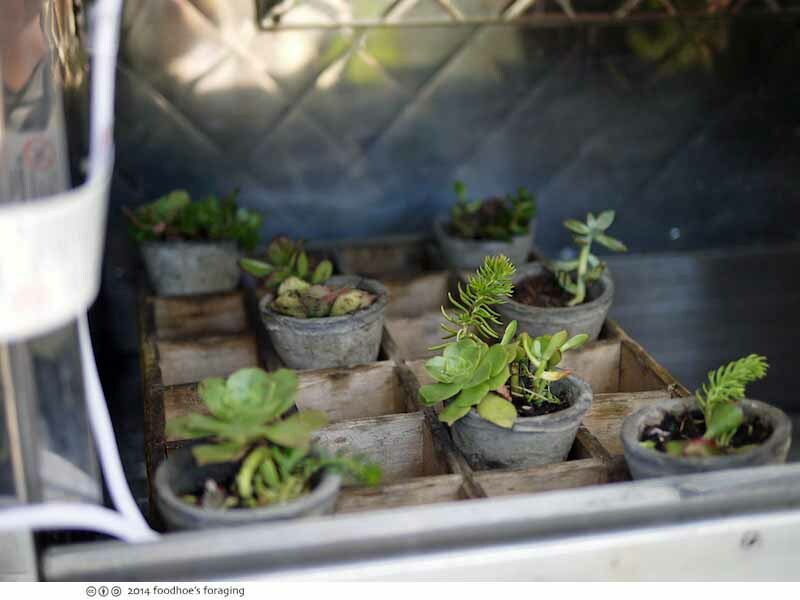 One of my favorites is the Gostreatery truck which has artistic touches like rustic planters filled with succulents, distressed wood set against the shiny metal of the truck and modern edgy graphics. 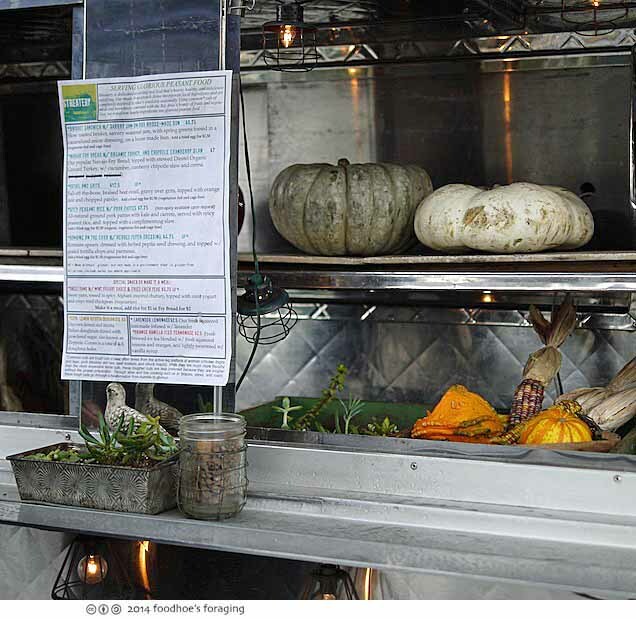 It is full of visual appeal, and as they are able to tame the stainless food truck to look cozy and inviting, they transform humble ingredients into glorious peasant food. 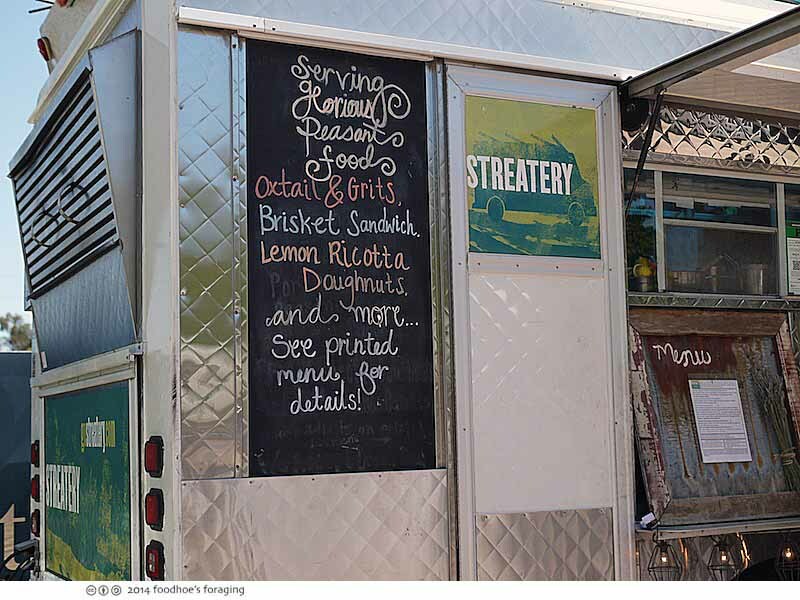 To get more information about food trucks, one must rely upon social media to get their schedule, look up their menu and to learn more about the people behind the food. 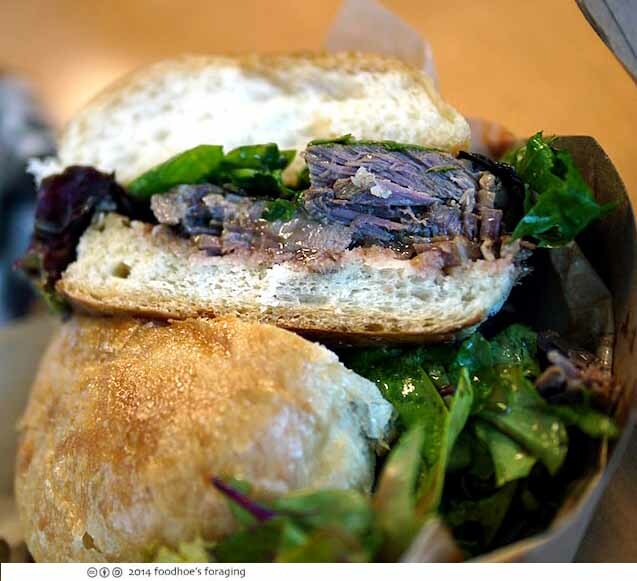 The about page on their website has a wonderful personal story of the chef, who professes “a passion for made-from-scratch cooking, a knack for creating inventive dishes, and a refusal to associate deliciousness with wealth. 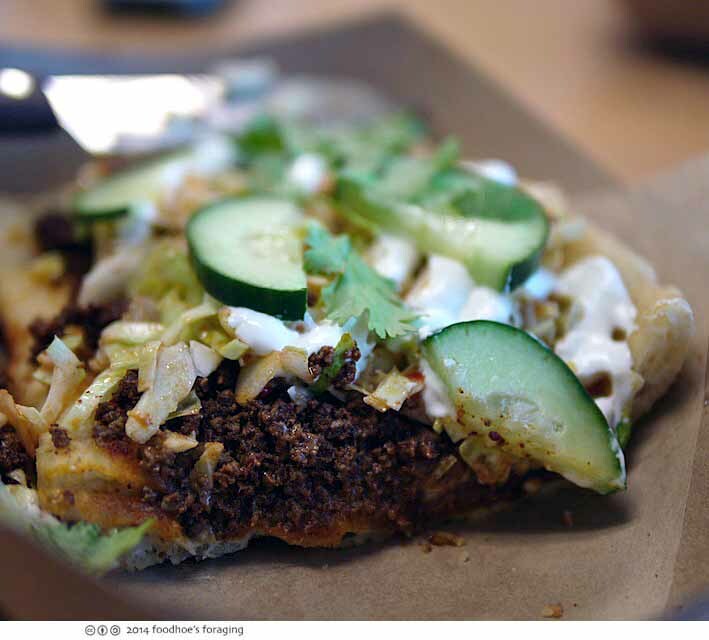 It may be nothing like what you have in mind when you think of peasant food, but it will have the spirits of peasant food—nourishing, hearty, delicious, inventive, and all made from a labor of love.” And from the dishes that I’ve eaten from GoStreatery, I’m a peasant food fan. 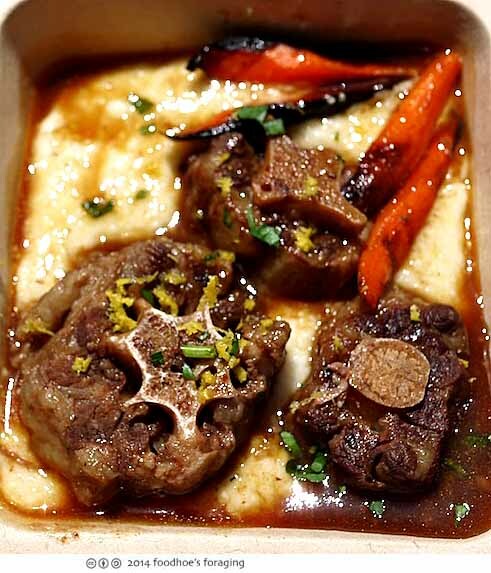 This is the dish that hooked me, their fall-off-the-bone, braised beef oxtail, drizzled with gravy over grits (or rice), topped with orange zest and chopped parsley ($12.50). I think it’s totally worth the extra $1.50 to add a fried egg. 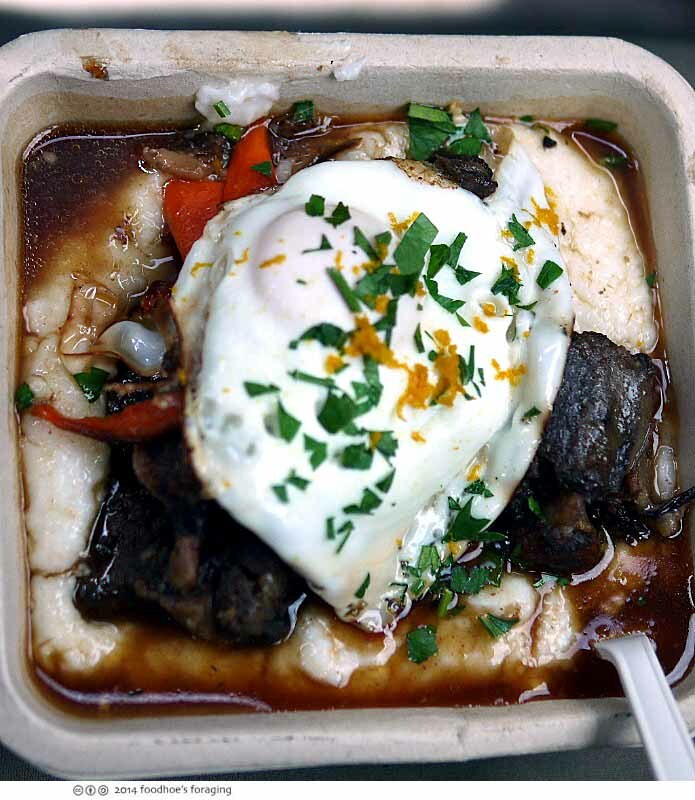 The grits are rich and cheesy and are absurdly decadent with the full bodied and flavorful gravy, each bite is brightened with fresh herbs and aromatic shreds of orange zest. The first time I ordered it without the egg, and you can see the gorgeous oxtails swimming in their delectable juices. You order via the top window, which requires standing on tip toe to make payment and they are happy to lower the tip jar for the vertically challenged customers. 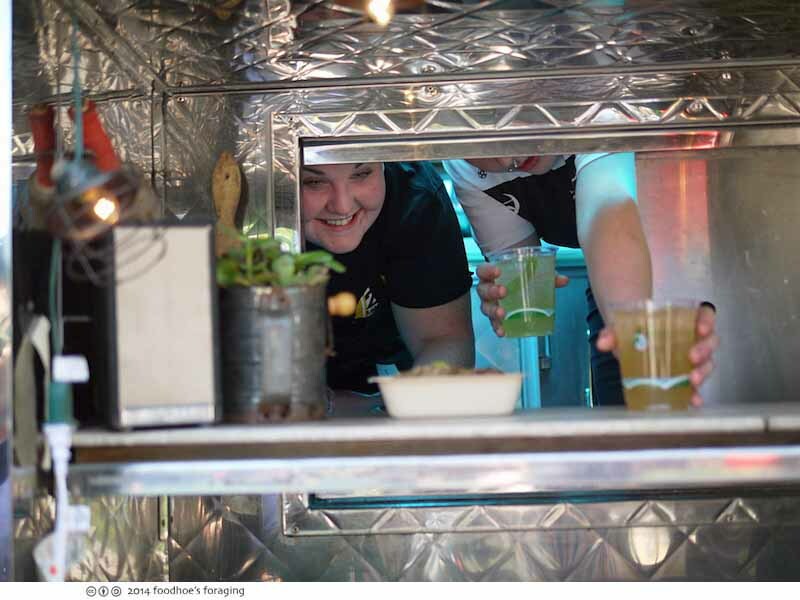 They call your name when your food is ready and you pick it up through the sliding service window where they have to crouch down to distribute the food and beverages. It’s rustic but rich and heavenly. 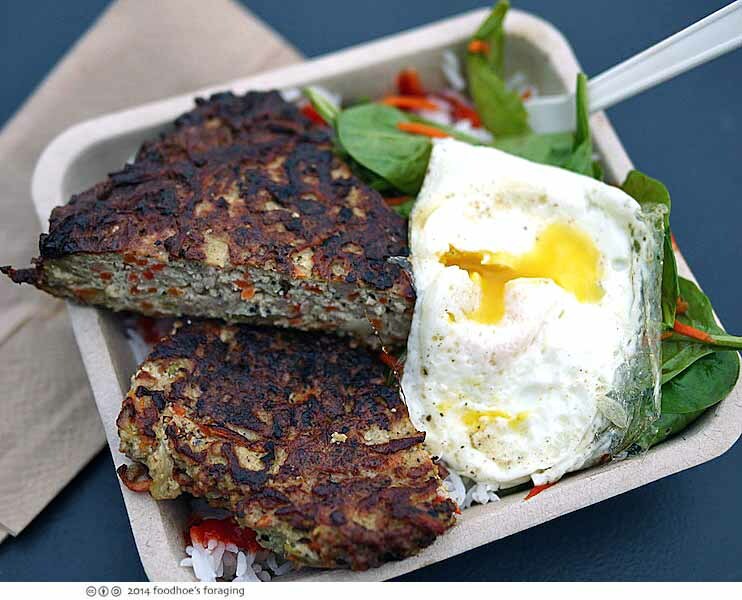 Another recommended dish is the All-natural ground pork patties with kale and carrots, served with spicy peasant rice, and topped with a complimenting slaw ($7.75). Of course I think you should add the Fried Egg for $1.50. The patties were hefty, but light and airy, full of fresh flavors from the vegetables, perhaps eggs, and some cheese, the rice had a liberal squeeze of spicy sriracha sauce that mixed in with the egg yolk and made an irresistibly lovely lunch. 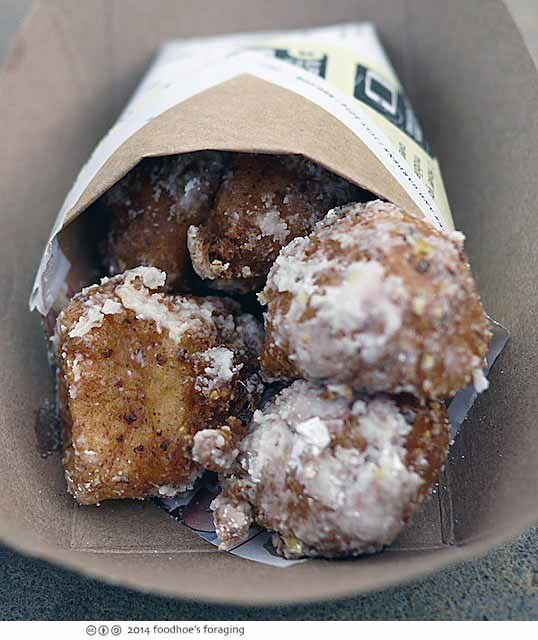 I’m saving the best for last, the Lemon and Ricotta doughnuts ($3) dusted with powdered sugar, also known as Zeppoles. So dang good! 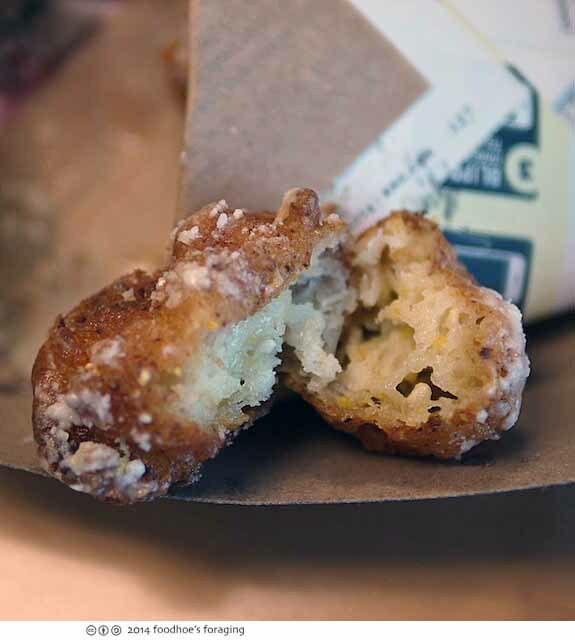 The balls of fried dough are tender with a wonderful eggy density. Each bite is both crisp and tender, infused with a bright lemony flavor and delicate sweetness from the powdered sugar. Super hella addictive! While you wait for your order you can admire the succulent garden and other living art on display. 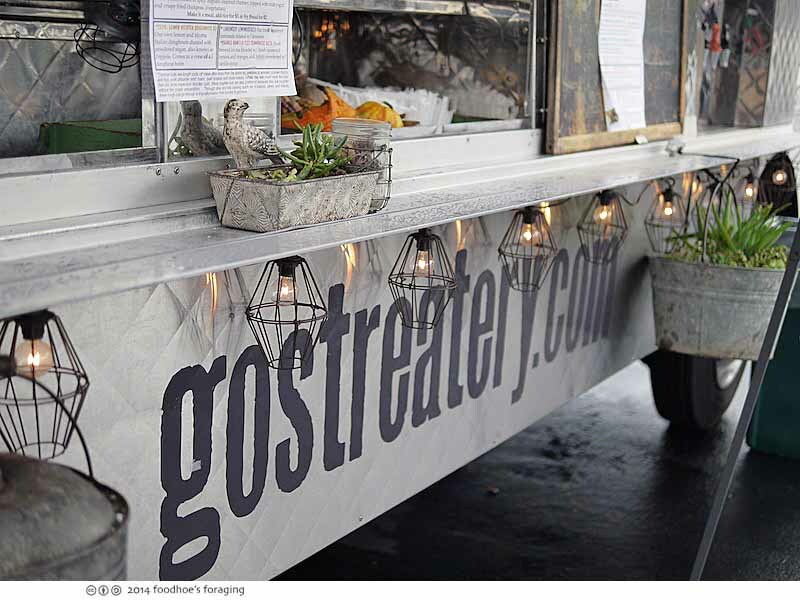 GoStreatery brings delicious hearty food that is made from scratch, and introduces creative and inventive flavor combinations that are a treat for the jaded tastebud to discover. You can find their schedule here, which takes them all over the East Bay. I’d love to try Navajo fry bread. fry bread has been high on my list of things to eat for quite some time, and i’m getting tired of waiting! 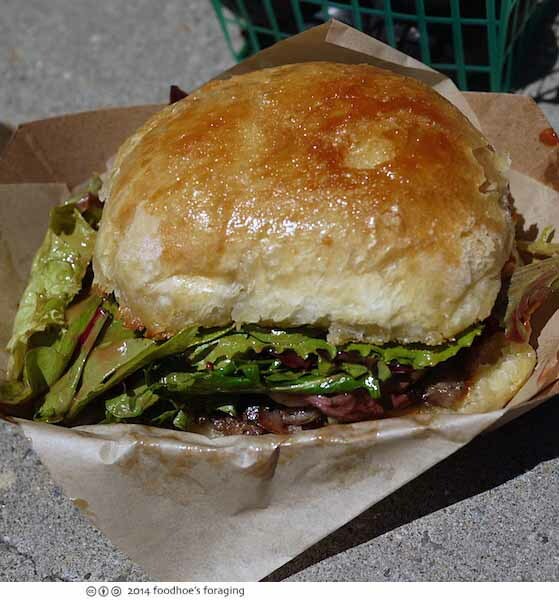 this is some primo street food! Next post: It’s time for a dungeness crab feast!